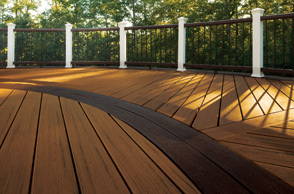 We know there are a wide variety of decking materials available to you, and deciding which to use can be difficult. Budget is usually a big factor in this decision, so to help with your decision-making process,we’ve included base pricing for a couple of our favorites. Most other brands of composite decking that we’re comfortable installing land between Trex Select® and Trex Transcend®. Materials and labor for installation of a frame of Treater Series kiln dried Southern Yellow Pine 2x10. These prices are a tool for your convenience only, for comparing the costs of the different materials and getting a general idea of what your overall budget will need to be. Your final cost will generally be more, determined by factors specific to your project. Trex Selects® $21.28 per sq. ft.
Trex Transcend® $24.82 per sq. ft. Exotic Hardwood (lpe) $37.64 per sq. ft.
Western Red Cedar 5/4” $20.12 per sq. ft. Your final price will be determined by adding to the base price the cost of railing, facia, structural work specific to your project, permits, engineering, etc. and our labor rate for any extra work involved. The materials listed above are our recommendations. If you have a different material in mind, we will quote you a price using your chosen wood or composite product. We have years of experience with various composite materials on the market and will gladly share our opinion based on that experience if you’re interested. Some brands give better value than others. We accept major credit cards. .
All-Pro Decking is a division of Topnotch Construction Inc., a residential construction company located in Lyons, Colorado.